For years it’s been obvious to me that federal Border Patrol agents are operating well outside the law at internal Border Patrol checkpoints and via roving patrol. Indeed, my Roadblock Revelations blog and videos have been largely dedicated to exposing this lawlessness through first hand experiences and research that I’ve been slowly piecing together and sharing online. I’ve also submitted quite a few FOIA (Freedom of Information Act) requests over the years regarding official USCBP policies and procedures. The purpose being to compare the way agents are actually conducting roadblock operations to how they’re supposed to be conducted according to official agency policy. All of my FOIA requests have resulted in the Border Patrol further violating the law by either refusing to respond at all or failing to provide any sort of meaningful reply (the most recent examples of this will be posted in the near future). The reason for this has also been obvious to me over the years. 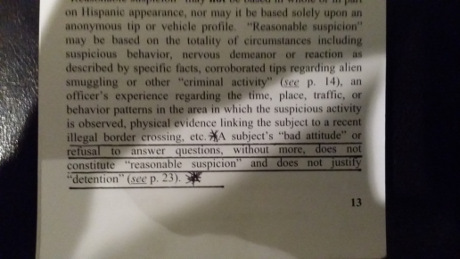 Border Patrol top brass & supervisors know their agents are violating the law while operating outside agency policy but don’t want irrefutable evidence of this fact to see the light of day. Unfortunately for the Border Patrol however, it’s impossible to hide such malfeasance forever and as more and more people have awoken to the lawless nature of Border Patrol operations against the general public, the heavily fortified wall of secrecy and unaccountability the agency has built around itself is slowly fracturing. This is especially true as larger organizations such as the ACLU have started taking an active interest in Border Patrol abuse via internal roadblock operations, roving patrols and FOIA violations. 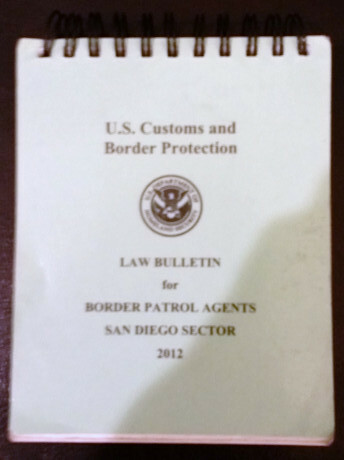 The image appearing above is from the cover of an official U.S. Customs and Border Protection Law Bulletin from 2012 issued to Border Patrol agents operating in the San Diego Sector. The San Diego sector in turn falls under the jurisdiction of the United States Courts for the 9th Circuit which includes Alaska, Arizona, California, Oregon, Washington, Hawaii, Idaho, Montana & Nevada. As such, legal limits placed on Border Patrol operations in the San Diego sector by federal courts have applicability in all Border Patrol sectors that fall within the boundaries of any other state in the 9th circuit as well.